The Philosophy Program offers the BA in philosophy, a philosophy minor, comprehensive solutions to augmenting another major with the philosophy major, and a special track in philosophy designed specifically for those seeking admission to law school and a career in law. Please see below for a short history of the program: How we started and important accomplishments along the way. We philosophy faculty are also happy to meet with prospective and current students to discuss the program and the opportunities it provides: contact us! When Texas A&M University-Corpus Christi (TAMU-CC) faculty members designed a core curriculum in preparation for the admission of the University’s first freshman class in 1994, they assigned a unique and central role in that curriculum to a philosophy course designated PHIL 3340: Foundations of Professional Ethics, making it the capstone course (and sole upper-level course) of the core. A sprawling endeavor encompassing three large lectures and a dozen discussion sections, Professional Ethics enrolled nearly 600 students every semester and involved the efforts of eight to ten faculty from across the colleges. As the capstone course, it would provide a transition from the rest of the core to the students’ work in their major fields, requiring students to apply knowledge and skills acquired or developed in their core courses to the study of ethical issues in their majors and prospective careers. Since 1996, when TAMU-CC hired its first two Philosophy faculty members (Piker and Sencerz), Professional Ethics not only performed its capstone role well, but also introduced students to the study of Philosophy and prompted many of them to take additional Philosophy courses and some of them to join the Ethics Bowl teams. More a sort of team-based competition in deliberation and argumentation than a debate, our involvement in the Ethics Bowl has been long and storied. Indeed, under the coaching of Piker and Sencerz, the University won the 2001 National Ethics Bowl, likely the smallest university to ever have done so. Since then Philosophy has fielded teams to the regional and national Ethics Bowl competitions, winning enough trophies to completely fill the trophy cabinet in the Dean's suite of offices (FC 203). In addition to winning the Nationals, our Ethics Bowl teams have compiled a record of four regional titles, three finishes in the top ten nationally, and eleven top three finishes (regional and national combined) in ten years of competition. They have attracted both regional and national attention, receiving (for example) a commendation in December 2007 from Corpus Christi Mayor Henry Garrett; and coverage in the New York Times (“Ethics Bowls: Where There Is No Final Answer,” 8-5-01) after winning the National Ethics Bowl Competition in March 2001. To meet increasing demand for the minor in philosophy, the College of Liberal Arts hired two additional philosophy faculty members, Berkich in 2002 and Tiller in 2004, significantly expanded its course offerings, and established a successful minor in Philosophy. Thanks in large measure to Andy Piker's dogged efforts over the span of approximately three years, we were delighted to announce that the A&M system board granted the philosophy program at A&M-Corpus Christi authority to begin offering the Bachelor of Arts in Philosophy Fall 2011. 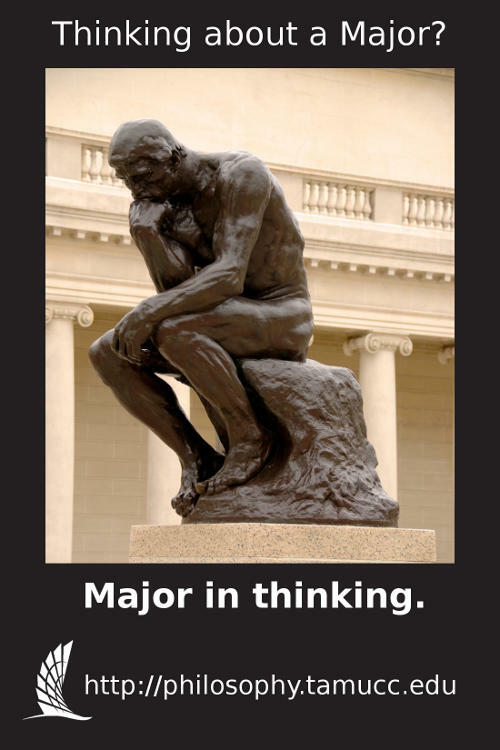 As our former Dean Richard Gigliotti was fond of saying, "if the university could have only one major, that major would have to be philosophy". Since then the program has continued to expand. In particular, our involvement in the university's core curriculum has greatly expanded. Although Professional Ethics was eventually eliminated from the core requirements, it has been renamed Introduction to Ethics and continues to see strong enrollments as a popular course. Introduction to Philosophy was likewise introduced into the core curriculum as an alternative and, under Tiller's adroit direction, has seen spectacular increases in enrollment. Finally, Piker and Berkich successfully argued to Introduction to Logic and Critical Thinking in the core curriculum as a math core requirement, and it has continued to expand our already outsized (for a program this relatively small) footprint on the university's core educational mission. In order to meet the demands for all the courses philosophy must offer each semester, both introductory and upper-division, the program hired in 2013 Ana Andrei to serve as part-time adjunct faculty. She quickly became a full-time adjunct and has most recently accepted an offer for a more permanent status as Professional Assistant Professor beginning Spring 2018. We are proud to have Andrei bring her talents, expertise, and superb teaching to the program. Even with five full-time faculty, the program is still not able to meet demands for its curriculum. Several years ago Terry Toma joined the faculty on a part-time adjunct basis, offering sections of Intro to Philosophy and Intro to Ethics. We are grateful for his efforts, as are the many students he teaches.